Fazilat studied her high school years in Semnan, northcentral Iran. She was very good in math. Although there was no girl school in her neighborhood featuring math, the Department of Education approved her admission to the boys’ high school to study math. She received her diploma in math with the highest grade in the region. In addition to math, she was very talented in other fields as well. Because of her religious inclinations, she sympathized with the PMOI. After the victory of the Iranian Revolution in 1979, she joined the Muslim Students Society in Tehran University’s School of Technology in spring 1979. Two of her uncles were affiliated with the regime who apparently arranged for her arrest. After being arrested, due to the efforts of her mother who appealed to the Ayatollah Montazeri at the time, her sentence was commuted to jail sentence. 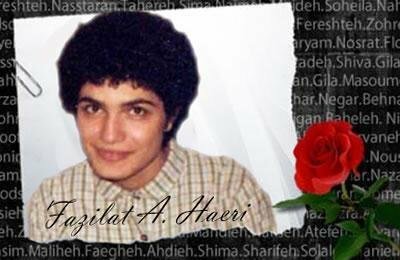 Fazilat was serving her sentence in prison until 1988 when she was executed along with 30,000 political prisoners who were massacred in summer that year for refusing to renounce their support for the PMOI.